For the Frankish bishop of this name, see Cunibert. 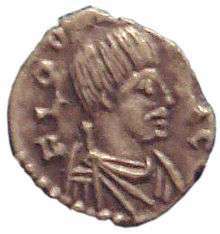 Tremissis of Cunincpert's, minted in Milan. Cunincpert (also Cunibert or Cunipert) was king of the Lombards from 688 to 700. He succeeded his father Perctarit, though he was associated with the throne from 680. 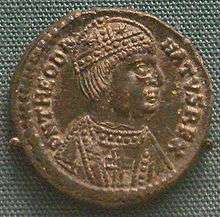 Soon after his assumption of the sole kingship, Cunincpert was ousted by Alahis, duke of Brescia (who had previously been duke of Trento). Alahis had also rebelled during the reign of Perctarit but it was Cunincpert who, according to Paul the Deacon in the Historia Langobardorum had persuaded his father to show mercy. Perctarit is reported to have warned his son of the consequences. It was thus soon after Perctarit's death that Alahis forced Cunincpert to flee to Isola Comacina, an island in the middle of Lake Como. The only extant record of the rule of Alahis is contained in Book V of the Historia Langobardorum of Paul the Deacon. His rule is portrayed as burdensome and tyrannical and particularly antagonistic to the Catholic Church. Having lost the support of the Church and crucially of the 'people' (notably Aldo and Grauso) Cunincpert was able to return to Pavia and resume control. Alahis, however was able to acquire sufficient support to bring the matter to battle. Cunincpert with the men of Piedmont defeated Alahis and the men of Venetia at the Battle of Coronate, on the Horn of the Adda, near Lodi in 689. Alahis was slain in battle. Cunincpert suppressed other insurrections during his reign, including that of the usurper Duke Ansfrid of Friuli. He also successfully settled the schism in the Italian church between Aquileia and Grado. He died in 700 and was succeeded by his young son Liutpert, the regent Ansprand, and many rebels. Many wars took place during his reign. 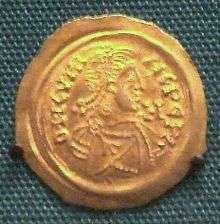 He is notably the first Lombard monarch to strike coins in his image. ↑ "German Tribes org Lombard Kings". GermanTribes.org. Archived from the original on 18 July 2010. Retrieved 18 July 2010.